Actually, he looks more like a robot Leno. I was just about to say that. Needs a bigger chin though. Not Letterman as in David Letterman, Letterman as in college athlete. Sigh. Much as it has nothing to do with the drawing, i’d just like to know, when are we likely to get some form of rifles as weaponry on heromachine 3? @Imp: Had the plan been to make a robot letterman BEFORE I started drawing, yes. 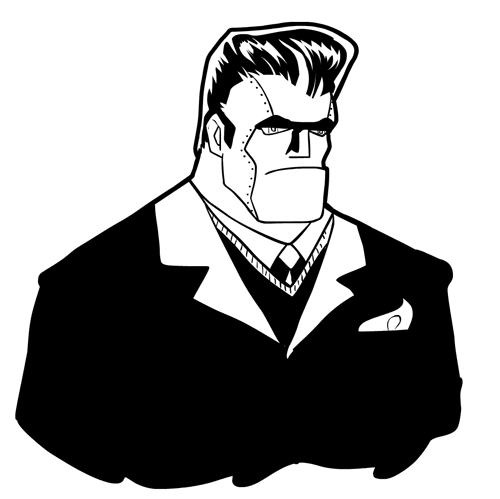 But I just drew it, and then the next day when I posted it and had to come up with a headline, I thought, hey, with that sweater vest thing, Fifties style hair, and tie, he looks like a college guy. Headlines are evil. I thought college frat boy. Who wears a sweater vest over a shirt and tie under a jacket with a handkerchief in a lapel? He reminds me of Tor of the Mighty Orbots.